Sorry, we are currently sold out of 'Om Symbol Shoulder Bags, Single Color'. Please click the Wait List link below and you will be notified when it is back in stock. Om symbol shoulder bags in a single solid color with the Om Sign dyed in black ink. These shoulder bags are made of 100% cotton and the same Om Symbol design is on both the front and the back of the bag. 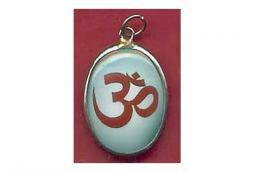 Colors: These Om Bags are available in the following colors: Dark Blue, Blonde, and Light Gray colors. These shoulder bags carry quite a bit of stuff (they are 16 inches wide by 18 inches tall - not including the shoulder straps), so they make great every day bags. The all cotton design makes them durable. Please note that they don't have a lot of frills, so there are no inside pockets or zippers. On the other hand, these Om bags are great for shopping.